Back in October last year I welcomed the news of Formula 1 commentator Murray Walker’s 95th birthday and remarked on his long time as a motor sport commentator. Note that I said motor sport for Murray was reporting on all forms of motor sport long before he became famous as a commentator in Formula 1. He followed in his father’s footsteps as his father, Graham Walker, was not only a motor cycle racer but the premier motor cycle racing commentator on radio long before they thought about television. So Murray like many in Formula 1 like our members Damon Hill and Nico Rosberg, had to fight hard to avoid staying in their father’s shadow. Luckily for Murray he always had a sense of humour and an agile mind so he was ideal for the advertising business which, in Britain at that time was trying to match the wit and humour of American advertising which was in vogue in the 1960’s and’70s. 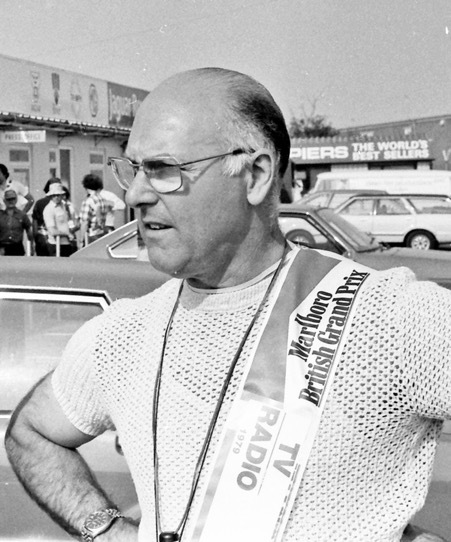 So Murray Walker became a well-known star in British advertising through some of the slogans and advertising commercials he created even though the general public did not know the name of the man who produced the words and the pictures. I was fortunate in meeting and working with Murray Walker a long time ago, 1961 to be exact. Scottish Television, the first commercial television station in Scotland, had made me their motoring correspondent and so I was used to the odd spot on various programmes. 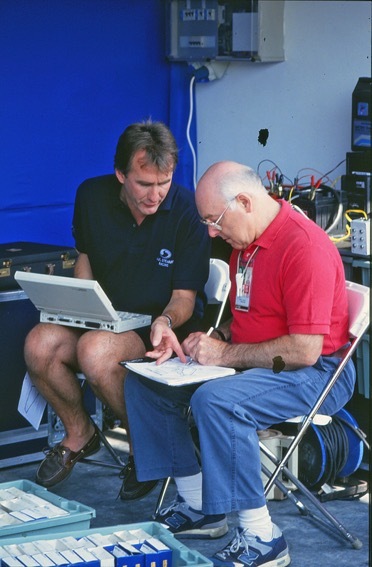 Murray at work in Macau taking notes as usual with Andy Miller of Paul Stewart Racing. 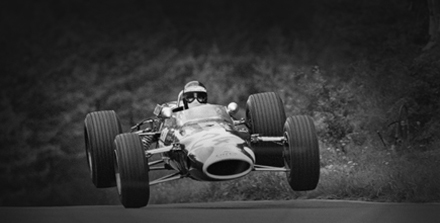 However, STV who’s sporting coverage rarely got away from football, football, football, decided, in their wisdom, to try and televise motor racing live during a full Sunday afternoon sports programme. They called me and asked if I would like to do back up the lead commentator they had arranged and for a moment my ego was punctured, why did they not ask ME to be the lead commentator ? I was later told that the lead commentator would be a young chap from London called Murray Walker and of course I knew his name and the fame of his father and was actually honoured to be working with him. 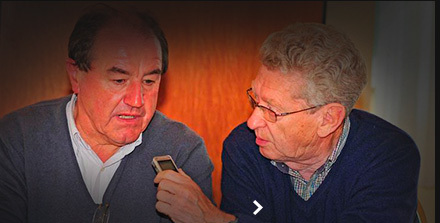 Well, it was an experience both Murray and I have laughed over in the many years since. For a start STV knew about football but for this race meeting at Charterhall, a flat airfield with no buildings save an old double decker bus that acted as Race Control , they did not have a clue. In their wisdom they built a tower out of scaffolding with a wooden ladder tied on to it, and a platform about twenty feet high. On it was a table, two chairs, a black and white television monitor the size of an I-pad and two microphones with no wind socks over them to cancel out wind noise. The next problem was how to fill the gaps between races which could extend to more than ten minutes so despite some of the time being used for ads we had to fill the gap. 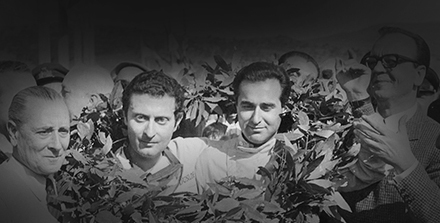 The arrangement was simple, Murray would study the programme and prepare his notes and I would roam the paddock looking for drivers I could interview between races before rushing back up the ladder to sit with Murray for the next race. Before the first race Murray and I found the STV boffins had forgotten about another problem, the positioning of the tower in relation to the sun, so we found that when we started to commentate the sun shone straight into the TV monitor and we were working with moving blobs on the screen. With the first race there were a number of local Scottish drivers including Ron Flockhart, who won it, and Murray roared into his commentary at 150 mph but half way through the first lap I could see he was struggling trying to work out who was who so, microphone in hand and still in full song, he turned to me, shrugged his shoulders and handed over the commentary to me to complete. Luckily the sun then moved slightly and we continued with Murray at his best a true professional. 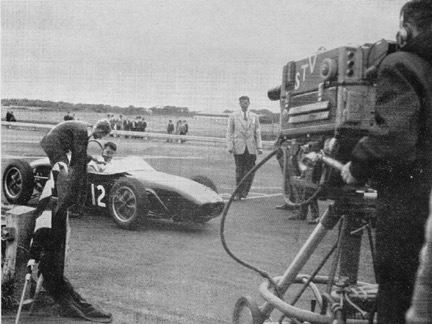 At the end of the race the writer interviews winner Peter Procter with his Lotus 19 in front of the STV cameras. About two years later a friend in management at STV handed me a copy of a fax that the director of programmes had given the sports department when planning that first live outside broadcast of motor racing. It read “…….I do not think Graham has the experience to carry the main commentating duty and we have signed up a young man from London who comes well recommended : Murray Walker.” How true it was but I did manage to learn and later was actually allowed to be lead commentator in a series of live broadcasts they did from the Ingliston circuit a few years later. I mentioned Murray and his advertising days and we often talked about that and everyone knows about his fame writing such slogans as “A Mars a Day helps you work Rest and Play” but the favourite story he told me is one less well known. His agency was asked by the major birdseed manufacturer Caperns, to help solve a problem for them. They found that sales of bird seed were not rising fast enough to maintain profitability and so what they needed was a campaign to encourage more people to buy budgies and caged birds so increasing the base market; and Murray got the job. He explained how he and his team had worked out a TV ad that would feature two budgies in a cage, one at either end of the main rod on which the budgies were standing. At a given signal one budgie would sidle along the rod and rest its head on the other budgie so giving the “Awwwwwww” factor and the catch line was “…an only budgie is a lonely budgie” This would encourage people to go out and buy an extra budgie and so promote the brand. Murray explained they had gone to the leading budgie trainer in Britain who had trained a budgie to do exactly that on cue. He demonstrated this to them in the Agency and then they came to film it and the budgie refused to budge, so to speak. Eventually they had to abandon the whole project. Murray, you are someone special.